The Black Box Club: MARTINE BESWICK: SLAVE GIRLS / PREHISTORIC WOMEN HAMMER FILMS 1967 REVIEW AND STILLS GALLERY PART ONE. MARTINE BESWICK: SLAVE GIRLS / PREHISTORIC WOMEN HAMMER FILMS 1967 REVIEW AND STILLS GALLERY PART ONE. While One Million Years B.C. spawned a plethora of copy cats, not even Hammer itself could seem to recreate the cult success of Raquel Welch in an animal skin bikini. Hammer's multiple attempts at regaining the cult status in some of it's "prehistoric" adventure films didn't seem to pan out too well. 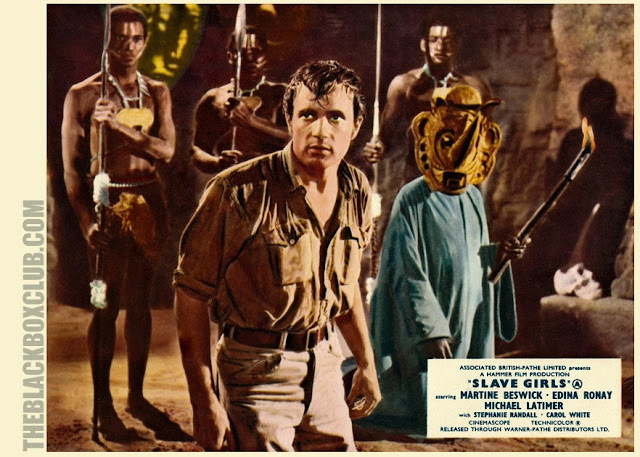 One such film was Slave Girls, filmed with the title Prehistoric Women, produced in succession with and completed prior to One Million Years B.C. made use of it's costumes and one of its supporting cast members, Martine Beswick, yet was not able to gain the same cult status. Prehistoric Women is a story about a jungle guide named David Marchand, who finds himself transported back in time after trespassing onto dangerous native tribes land, those who worship the seemingly extinct white rhino. Marchand is captured by a group of lovely dark haired beauties, with their leader Kari wishing him to be her new boy toy, he refuses and finds himself locked away with the rest of the men. But the men aren't the only slaves of this tribe, all blondes are slaves as well and are regularly bartered off as peace offerings to the savages who live out in the wildness of the open jungle. Marchand quickly falls in love with one of these blonde beauties named Saria, together they plan to overthrow Kari and her followers in hopes of bringing equality back to the tribe and ridding themselves of her bonds and the fear of the savages that terrorize them. Prehistoric Women follows the similar plot of When Dinosaurs Ruled The Earth, with the main aspect of the film being the oppression of blondes. But where that film sorely lacked, Prehistoric Women managed to get right. First off I believe this is the only Hammer prehistoric film to actually incorporate English dialogue which was a blessing. There's nothing worse than watching a boring film that has no dialogue. Second there's hardly any men seen in the film. When watching a film based in the period of loin cloths the last thing I want to see (as a man) is half naked men walking about in the jungle, so a film entitled Prehistoric Women seemed to guarantee very little of that, and provide more of the only thing that was even remotely good about When Dinosaurs Ruled The Earth. With my only comparison at this time being When Dinosaurs Ruled The Earth, Prehistoric Women easily stands as the victor. The story is mediocre and at times extremely corny, but at least it's easy to follow, understand and enjoy, I couldn't say the same for the other film. Both Martine Beswick and Edina Ronay played their roles quite well, and once again Hammer proves it's one of the best in terms of production value of even it's lowest budget films. But most would not agree with me, in fact Prehistoric Women is regarded as one of Hammer's worst films. Martine Beswick was even awarded "The Worst Hammer Film" award in 1994 at FANEX, and the authors of Hammer Films: An Exhaustive Filmography go as far to say it's an embarrassment to include it in their book! Personally I think they're over reacting quite a bit, Prehistoric Women is far from the worst and I believe much more entertaining than some of Hammer's other fantasy endeavors. Overall, I thought Prehistoric Women is a well fashioned compared to some of its counterparts and it's a shame that it never received the credit it was due. Even though it was actually completed before One Million Years B.C. 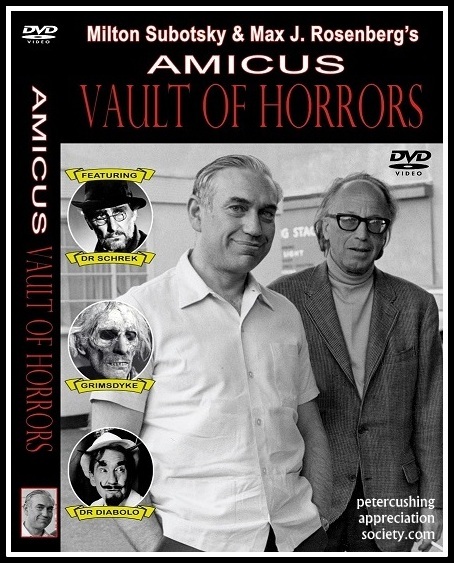 it was two years later before it was released in which time nearly twenty minutes was cut, and at which time it didn't garner much success or a very good reputation. Even today it appears to be almost a forgotten memory in the franchise, there's not even much written about the film in most my small collection of Hammer reference books, and if anything is it's usually negative. But even while it lays in the shadow of success of Hammer's prehistoric flagship One Million Years B.C., it's a film that's definitely worth checking out if your a fan of the genre, and in my opinon is probably the better of all of Hammer's prehistoric films. A FULL GALLERY OF PUBLICITY PHOTOGRAPHS COMING TOMORROW IN 'SLAVE GIRLS' GALLERY TWO! Hi. Yes, this film is one and the same. It had several titles, 'Prehistoric Woman' 'Slave Girls'. it was originally released in the UK with Hammer Films, The Devil Rides Out. Thanks for your comment.